Today we want to introduce our special friend,Francesco Baschieri. He is the founder of Spreaker, the first start up that has joined the Mind The Bridge GYM this summer in San Francisco. Francesco is a serial entrepreneur, passionate about new technologies and business models and always interested in the next innovation that will change the world. Spreaker, his last adventure, is a true Web Radio 2.0 where every show is created by the audience itself. Spreaker has shifted the paradigm from creating a complete radio stream to producing a single show. Radio stations are then created by assembling single pieces (one after another) into a continuous stream of audio. “Creating a show is easy and does not require any technical expertise: all the necessary tools that users might need are available online at www.spreaker.com. 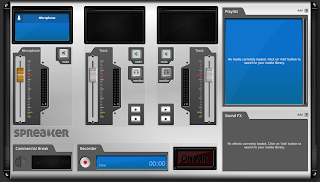 The DeeJay Console TM allows users to mix live audio input from their microphone with music tracks and sound effects which are available online as part of a large user-friendly library. At the well-known Pier 38 Francesco has spent 3 months trying to bring his start up to an international dimension: he has participated to numerous events, business meetings and social happenings and was actively participating to the entrepreneurial life of the city. For this reason we thought to realize the following interview in which he presents his company and tell us his experience in the Silicon Valley. For those that might join our crew in the future, take into consideration all his suggestions. Ciao Francesco, It was a pleasure to work with you! great vide and post Danilo and thanks Anna for your support too! I'm sure we'll see you soon.